Lindsey Vonn and P.K. Subban are dating — and have made their romance red carpet official! The Olympic gold medalist, 33, and the 29-year-old hockey player — a defenseman for the Nashville Predators — stepped out together Wednesday night at the 2018 CMT Music Awards in Nashville, where they packed on the PDA while posing for photos ahead of the show. 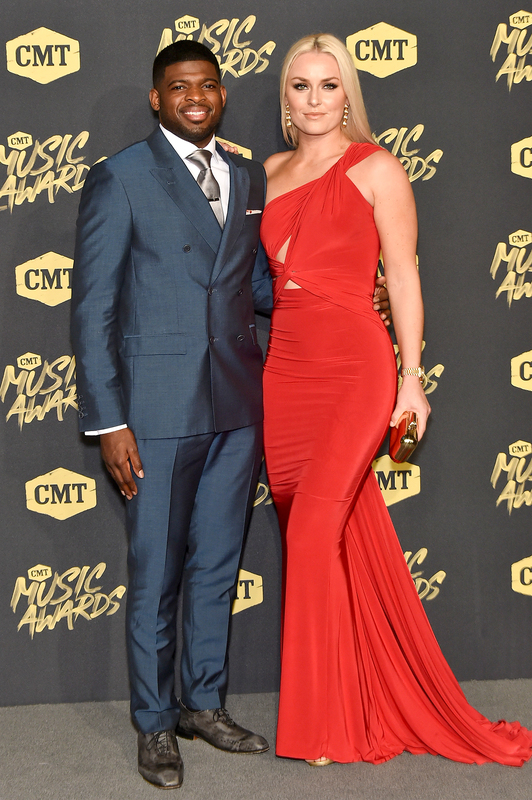 “They’re in that beginning stage of a relationship where you can’t get enough of each other,” a source told PEOPLE exclusively of the pair, both of whom presented at the CMTs. Sports blog TerezOwens.com was first to report on the budding relationship in April. At the time, the site shared Instagram stories Vonn posted from a Predators game. Then, April 27, Nashville sports reporter Justin Beasley tweeted a photo of Vonn at another Predators game, allegedly at Bridgestone Arena to support Subban. Vonn last dated NFL assistant coach Kenan Smith for a year before the pair amicably split last November. The alpine skier was also previously linked to Tiger Woods, whom she dated for nearly three years before calling it quits in 2015.